Visit our new website at www.GetIntoDigital.com. self-financing sales lead generation strategy! Thanks for visiting the London Business Advisers Ltd digital marketing page brought to you in association with GetIntoDigital.com. As Digital Marketing Consultants we help businesses to both make more money and save more money by implementing a digital marketing sales lead generation strategy. This webpage contains a globally unique portfolio of marketing solutions that turn ‘business issues’ into ‘business opportunities’ while opening multiple new routes to market for any company of any size and creating new sales leads 24x7x365. This webpage also contains demonstrations, samples, testimonials and information to help you understand and gain personal experience of our solutions, solutions that are revolutionising the way businesses market themselves in today’s digital marketing era. Thanks for visiting this Digital Marketing sales page. Implementing a green e-communication strategy that reduces your operating costs and carbon footprint by saving on paper, post, packaging, ink and emissions is not just good for the environment! Digital Stationery™ turns your emails into a powerful lead generation and marketing tool and makes fantastic business by, amongst other things, creating brand awareness, driving traffic to your website, speeding up your sales process and cash flow ... while also doing your bit for the planet! Digital Stationery™ is optimised for sending emails from PC and laptop-based Microsoft email programmes - Outlook®, Outlook Express®, and Windows Mail® (in Vista). Recipients can read Digital Stationery™ in all Microsoft email reader programmes and online email programmes such as AOL mail, HotMail, gMail, and AppleMail, among others. Visit our dedicated Digital Stationery™ website and review some testimonials, samples and discover the multiple self financing business benefits. As an associate of London Business Advisers Ltd, if you would like to order a sample Digital Stationery™ in your company brand without obligation, then please complete the below form. PaperViewer™ digital brochures are an on-screen turnpage digital version of your company newsletter, brochure, newspaper, catalogue, prospectus, magazine, company report, event guide or any other paper publication! Click the turnpage brochure image to see a sample publication and just some of the features you can incorporate to turn your current paper edition into an exciting on-screen interactive digital edition. An edition that offers you unlimited distribution with reduced production and distribution costs, is never out of date and can be used within your Digital Sales Lead Generation Programme! Whatever your marketing needs, we already have similar clients using similar publications to great effect and we are that sure you will identify the benefits of a PaperViewer publication that we will even do a FREE sample of your current paper product for your review. Complete the following form to request a free copy of your marketing material in our PaperViewer™ format. If you have content please upload it below or include a weblink where we can download it and one of our consultants will contact you to discuss your requirements. If you have any questions, please check out the PaperViewer frequently asked questions guide at www.faq.paperviewer.co.uk. Visit our dedicated PaperViewer™ website to review more testimonials, samples and discover the multiple self financing business benefits. Imagine checking your emails and finding a regular flow of highly qualified opt-in sales leads in your inbox! Well, you can stop imagining because you are just about to discover GetIntoDigital.com's revolutionary LeadsByEmail™ and LeadsByText™ sales lead generation solutions! Whatever your advertising and marketing strategy our exciting portfolio of self financing sales lead generation tools can have a radical impact on your response rates and returns on investments. Whether it is online activities, such as your website, banner adverts, search engine campaigns or offline activities, such as local press, radio or TV advertising, GetIntoDigital.com is setting new trends and having a massive impact on business performance for companies on any size, anywhere! To experience a demonstration of the BrochuresByEmail™ content distribution and data capture website programme simply click on the button below. Click the following link to see another online marketing usage of our LeadsByEmail™ solutions. Visit Eazy Collect - Click the blue button and test BrochuresByEmail™ for yourself now! With or without an online brochure, magazine, newspaper, catalogue or any other marketing collateral, LeadsByEmail™ is available in multiple ByEmail brands and colour schemes. Click here to review the packages, brands and colour schemes. Check to see if your preferred SMS keyword is available! Your keyword could be a name, trade, location, hobby, subject, equipment, brand, or other commonly recognised noun! To reserve your keyword for up to 5 days without obligation, complete this short form and one of our team will contact you to discuss your requirements. *All words subject to latest availability and copyright. Note: certain keywords may incur a premium charge. LeadsByText™ is NOT a premium rate service and is best understood by sending the following standard rate text. LeadsByText™ is our flagship integrated product but facilitates multiple vertical market variations on the theme. Click here to find out more about our other LeadsByText products including, CarsByText, HomesByText, DiscoverByText, JobsByText, LoanByText, NewspapersByText and SamplesByText to name but a few! Is your business participating in the mobile growth explosion? Got your App yet? Getting text leads yet? Selling by text yet? We live in an ultra competitive 24x7 mobile economy and it is essential to structure your marketing mix across a wide range of routes-to-market. More importantly, you have to position your business stay ahead of the competition and welcome new business enquiries via the consumer's preferred communication tools. To really understand multiple benefits and the enormous opportunity that the Digital Smart Phone Websites package offers watch the following introductory webinar presentation to the mobile marketing and sales lead generation package. Mobile web growth is up 2000% (dotMobi) and forecasted to be bigger than desktop by 2015 but have you ever looked at your website on a smart phone? Small text, missing images, scroll bars, tiny links, needs dragging here, there, everywhere? Digital App-sites are a new digital technology that turns your current company website into an App-like mobile website which works across all mobile applications including iPhone, iPad, Smartphones, Androids, Tablets and even budget phones! You effectively end up with 2 websites on the same domain name - a desktop site and a mobile site! We are currently offering a free 7-day trial to those parties who are genuinely interested in entering the mobile marketing arena. To claim your free 7-day trial simply hit the trial request button and supply us with the basic required information to enable to create your free no-obligation sample. 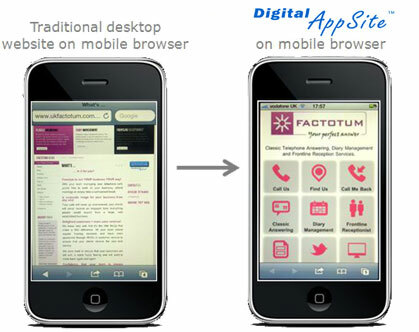 AppsByTextTM is an exceptional new call-to-action for App owners and mobile website owners. No more wondering who downloaded your App or who visited your website. With AppsByTextTM you can turn your App or mobile site into a powerful lead generation tool which means your business is now open 24x7x365 with automated content distribution and mobile phone number leads in your inbox! Whatever your advertising and marketing strategy, AppsByTextTM can have a radical impact on your response rates and returns on investments. Whether it is online activities, such as your website, banner adverts, search engine campaigns or offline activities, such as local press, radio or TV advertising, AppsByTextTM can have a massive impact on business performance for companies on any size, anywhere! The 3rd step in your marketing strategy is to harvest sales from your prospect and customer mobile database. Whether you already had the data, captured or purchased it, DigitalTexts™ and DigitalEmails™ enables you to communicate direct to your prospects pocket and PC with your choice of target marketing message and with the sure knowledge your message will be read! Visit our dedicated mobile marketing site at www.digitalsmartphonewebsites.co.uk to see some case studies and further details. As outsourced digital marketing consultants we help businesses to implement new routes to market and revolutionise their email, advertising, website and company marketing material performance through our globally unique suite of digital marketing solutions. Often this is a step-by-step strategy - click on the play button at right to find out how Suffolk Development Agency has implemented their programme and the impact it has had on their business. By adopting GetIntoDigital.com's solutions into your marketing strategy you will have the opportunity to turn many of your business issues into new business opportunities, any one of which could be worth 10's of £1,000's to your business. Visit www.50ReasonsTo.GetIntoDigital.com and look at just a few areas where our digital marketing stratagies can have an impact on your business. GetIntoDigital.com is setting new standards in environmental and economical business practices both internally and by way of cascading a ‘green’ business practice onto our customers. Companies using any paper marketing material to support or market their business, can now use a digital alternative to their traditional paper product and realise multiple economic and environmental benefits. Using a digital publication which can be ordered by text, delivered by email, or viewed on-line, means substantial reductions in printing, packaging, call handling and distribution processes while gaining an unlimited worldwide distribution of their content. As suppliers of digital publications, digital leaflets and digital stationery products, we also use distance selling software in order to minimize travel and emissions and all our order forms, leaflets, invoices and corporate brochures are only available in electronic format. So now you have a digital version of your company letterhead, brochure or any other marketing material, just think of the positive contribution you are having on the environment. No paper, ink, packaging, plastics, haulage emmissions etc! Now is the time to start and realise the environmental and economical benefits of implementing a Corporate Social Responsibility programme for your company! In addition to all the other business benefits, Digital Stationery™ is also a great way to build your social networks. By including your chosen 'social' logos in your Digital Stationery™, you are maximising exposure to build your followers and networks. Every email and business communication you send can deliver both new and existing contacts back to your social pages. Imagine the number of contacts you correspond with who may already subscribe to Twitter, Linked In, Facebook, etc., but you did not know they did - and they did not know you did! We are pleased to announce that all new Digital Stationery™ orders will automatically include our exclusive "Link Activity Report." This up-to-the-minute report shows you exactly how many people have clicked through your stationery to visit your website, your online brochure, and your social networking sites. Click on the link above or the image at right to learn more! What will my Digital Stationery™ look like in recipients inboxes? Wonder what your emails will look like in the various email readers including PC's, laptops, web browsers, Mac's, smartphones, tablets? Click here to see how Digital Stationery™ looks in the top 20 email readers. All Digital Stationery™ orders are provisional and subject to mutual acceptance. You are not committed at this point. You will receive a notification email upon submission of your provisional order, following which one of our Consultants will contact you to finalise your design specification and answer any questions. Only then do we accept and complete your design from which a proof is created for your final on-line order acceptance. The Standard design has a colourful, professionally designed banner with a single tab linked to your website. The Advanced design has 2 - 6 tabs with links to several of the primary pages of your website (e.g., Products, Services, Customer Testimonials, Book Online, About Us, etc.). The Bespoke design can include additional features, such as a special visual design for the links, footer artwork, sponsor links, "Call-to-Action" buttons, or other specific requests. Please indicate your design preference in the order form below. If you have any questions or suggestions, we will be happy to discuss your design needs and adjust your order accordingly. including correct spelling, capitalisation, punctuation, etc. Section 1: Please enter your contact information and web address. Section 2: Please tell us your Digital Stationery™ preferences. Please send me a Digital Stationery™ design for my company. (Digital Stationery™ must be sent from one of these Microsoft mail programs. Section 3: Please review information for accuracy, then click the submit button below. For more detailed information about our products, please view our answers to frequently asked questions about Digital Stationery™. And click here for answers to frequently asked questions about PaperViewer™. Outlook®, Outlook Express®, or Windows Mail® are registered trademarks of the Microsoft Corporation.